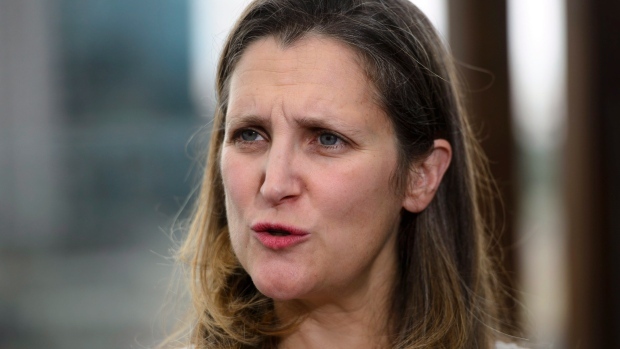 She didn’t name names, but Foreign Affairs Minister Chrystia Freeland is making it clear that U.S. President Donald Trump’s threat to intervene in Meng Wanzhou’s extradition case wasn’t helpful. “Our extradition partners should not seek to politicize the extradition process or use it for ends other than the pursuit of justice and following the rule of law,” she told reporters late yesterday afternoon on the heels of Trump’s comments to Reuters about possibly getting involved if it helps secure a trade deal with China. Meanwhile, a spokesperson for China’s foreign ministry said early today Canadians Michael Kovrig and Michael Spavor are being detained under “compulsory measures.” We’ll continue chasing informed perspective on the stakes for Canada’s economy and businesses with direct exposure to China. Bombardier said it was "extremely disappointed" Wednesday after it was dealt a blow on its home turf, having lost a US$1-billion Via Rail contract to German manufacturer Siemens. Brian Madden, senior vice-president and portfolio manager at Goodreid Investment Counsel, says "this is a competitive bid process" and "if Siemens builds better trains or can build them on time, they’re going to get the contract." Interesting to note that, by far, the most-read item on BNNBloomberg.ca in the last 24 hours is coverage of Via Rail’s decision to snub Bombardier by handing a nearly $1-billion contract to rival Siemens. It’s at least the second major setback for Bombardier on its home turf this year, after the Caisse de Dépot selected an Alstom-led consortium for the new Réseau express métropolitain rail link in Montreal. We’ll discuss the outlook for Bombardier’s rail unit this morning on The Street. Theresa May is hanging on to power as U.K. prime minister after retaining her party’s confidence yesterday while promising her colleagues she won’t run in the next election. The British Pound is trading higher against most major currencies this morning, and May is en route to Brussels for a two-day meeting with EU leaders where they’ll try to hash out next steps for Brexit. The European Central Bank confirmed this morning its 15-billion euro monthly quantitative easing program will end this month. The ECB also left its main rates unchanged. -Altagas will be a stock to watch today after announcing a number of measures to shore up its balance sheet, including a 56% cut to its dividend, and the sale of its stake in Northwest Hydro Facilities for $1.39 billion. -Empire Company’s fiscal second-quarter adjusted profit surged 36.5 per cent year-over-year, easily topping estimates in the process. CEO Michael Medline is describing it as "our strongest quarter" since he started the "transformation" of Sobeys' parent company. -Tilray has appointed a 10-person International Advisory Board to guide the pot producer on global expansion. Members of the board include ex-U.S. Presidential candidate Howard Dean and Lloyd Axworthy. -The Ontario cities of Markham and Mississauga have voted to opt out of allowing brick and mortar cannabis stores within their municipal boundaries. -10:00 a.m. ET: Detour Gold holds special shareholders' meeting regarding proxy fight with Paulson & Co.
-12:30 p.m. ET: Alberta Premier Rachel Notley delivers remarks and holds avail in Slave Lake, Alta.